Like Merchant Ships: She's Home! I've always thought Blogger provides excellent service without cost, but a major system failure on the one day you want to show your baby to the world is disappointing! Elise was born yesterday morning after a short and easy labor. We brought her home this afternoon. It's all a little surreal still. She is showing signs of jaundice and not nursing well, so tomorrow we have visits to the pediatrician and lactation consultant scheduled. I'm sleepy but well. In fact, I feel so good it's hard to believe I had a baby yesterday! Many thanks for all your prayers and well wishes. Congratulations...she is beautiful...and you look great too!!! It's unanimous - all my girls agree that Elise looks like a little doll! Glad you're feeling so well, too. Congrats! Oh, she's beautiful and so are you. Good luck with the doctor and the LC. Let me know if you need anything! Congrats on the baby girl. It will be fun to watch her grow up through your blog. We went through the jaundice thing with our first and last. The baby was as orange as a pumpkin by the third day and she had to be wrapped in a special "bili blanket"
Nursing was slow going with her but eventually she caught on and now at 2 1/2 she doesn't want to stop. So hang in there and I will be praying for you and her! She is adorable!!!! Good job, Mom! Congrats Meredith and family. Elise is gorgeous. I'm so glad you are feeling so well. What a blessing. as pretty as her mom. Bet she will be as frugal and smart as mom too! What a beautiful baby...and you look fantastic. Congratulations! How sweet! She looks like the perfect baby. Congrats! What a beautiful baby girl, and Elise is a beautiful naming. And you!! My goodness, you look absolutely stunning! Congratulations! You look great! Of course, she is beautiful and has such a pretty feminine name. We've done the jaundice thing the last four times. I always go early and that increases the liklihood of jaundice. The perfect remedy is to put the baby in sunlight or a bright window. I say perfect because it really works better than anything else in mild cases. My husband who is a scientist has always been amazed that something so simple has been so effective. It is so effective even in winter through a sunny window you could tell the difference by the next morning. Also nursing often helps. Going to the ped. is good as well because if there is need for more complicated treatment they will want to get a baseline measurement. If it is as simple as some sunlight and extra feedings then you will be so reassured from them telling you so. Take it easy! Congratulations, you both look wonderful! Sorry to hear she is having jaundice and not nursing well, that is a tough combo but glad to hear you are the right track with the pediatrician AND lactation consultant. Sean took a while to catch onto nursing but I didn't know to see a LC until he was six weeks old, and we both suffered for it, so I am always glad when another mama knows to get help from an LC. Good luck! Beautiful mom and baby. Love her name. I will be praying for your "getting to know each other" period. Congratulations on the safe birth of your little girl. Keeping you both in prayer for continued healing and nursing success. What a dolly! Elise is a very pretty name. I'm so happy for you...you are very blessed! Will continue to pray for the jaundice and nursing situation. You two look so peaceful. Glad to hear that you're home. Praying for a speedy recovery for both of you. Don't worry and get plenty of rest! 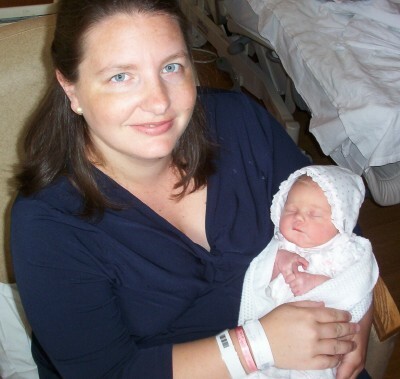 Sigh...Meredith, you and baby Elise just look beautiful. How sweet and pretty she is!! What does Andrew think, now that his little sister is here? And do you think that she looks like Andrew? I am so glad to hear that everything went so well for you; you have been in our thoughts and prayers over these past two days. She is just beautiful, and I think that the name you and your husband finally agreed on is beautiful as well. Hope you get a good report tomorrow at the doctor. I have used a lactation consultant twice with some nursing problems with one of my children and they are generally just wonderful. They have a way of making you feel like you are the best mom in the world for breastfeeding! Blessings from all of us here at our house in Illinois!! Many congratulations! She is just so beautiful. What a beautiful baby! All three of my kids were jaundiced at birth - and sunlight, as someone else mentioned, is a miracle worker. Also, because jaundiced babies are so sleepy, make sure that Elise is only wearing her diaper when it's time for her to nurse, and you can also gently wash her face and hands with cool water to keep her extra alert - I'm sure the LC will have lots of great suggestions today! Best wishes! And did I mention that YOU LOOK AMAZING? Are you sure you just had a baby?! You and the baby are stunning - just beautiful. My baby had jaundice and I would put him in front of a sunny window, worked great! Congratulations! She's beautiful and you look great! We just had our sixth baby six weeks ago, and like you I felt just like myself again the next day. Aren't babies such blessings???!! May the Lord bless you both (and your husband and son) abundantly! Congratulations, Mom and Dad! She is beautiful! May God bless you all as your family grows! Great name, as well- I knew a girl named Elise in high school and she was one of the kindest, nicest people I have ever known. Good luck with the nursing/other baby stuff. Many, many congratulations! What a beautiful little baby! God bless your family. Beautiful baby. Beautiful name. Congratulations to you and your family! Oh, she is so lovely! You look very well. I am so glad little Elise has finally made her appearance. Congratulations to your whole family. Congratulations! She's beautiful! Hoping you'll get the nursing and jaundice all worked out soon. How's you son enjoying being a big brother? What a beautiful mom and daughter! Wishing all of you many blessings! What a beauty! Congratulations! I love the name. May the Lord bless and keep you all. What a cutie! You look great! So glad everything went well. My son also had to use a bili blanket. We called him our glow worm and it certainly did the trick. Thanks for the great blog! Congratulations! For some reason, the picture's not showing up for me. Keep up the work with the lactation consultant. I had to take BabyMoney to the lactation consultant three times a week for 3 or 4 weeks before he finally got the idea. It was TOTALLY worth it! Congratulations on your new beautiful baby girl! She's gorgeous and you look GREAT! I love her little bonnet. Precious. Wow, you both look wonderful. She is such a precious little doll. Hope the nursing goes well. Adding my congratulations with all the rest! Hooray for you both. You look wonderful! Congratulations! She is beautiful, and you look wonderful as well! Congratulations! Elise is beautiful and so are you. Elise is the name of a dear friend's Mother, and I have always loved that name. Congratulations! You look wonderful and your daughter is so beautiful! P.S. I recently found your site and have been learning so much. I used to live in Nashville and then Smyrna when I was a newlywed. Congratulations Meredith! Elise is a beautiful baby girl. Meredith, she's beautiful! You, too! Big congrats! Meredith what a beautiful little baby girl!! Congratulations!!! God's abundant blessings to you and yours!!! Congratulations! You both, as others have observed, look absolutely beautiful. :) What a doll. Congratulations Meredith! I have been away and behind on the blog reading, so I'm sorry my well-wishes are coming in so late. She is absolutely beautiful. I hope you both have settled in now.